The question put to Dr. Mann at Disneyland today | Watts Up With That? UPDATE: 12:55PM Dr. Mann ducks a TV station reporter who requested an interview afterwards, see below. Steve McIntyre recently published a new graph on his website Climate Audit. Alerted to the fact that Dr. Mann would be speaking at the OC Water Summit, I was asked to submit a question, but I could not make it there in time given the short notice. A suitable proxy, our friend Roger Sowell, was kind enough to attend and ask a question. Here’s what I sent him in way of a primer, I don’t know the actual question he asked, but we hope to have a video presentation later as I was told it was recorded. Figure 1. Yamal Chronologies. Green – from Hantemirov _liv.rwl dataset; red- from Briffa et al 2008. How interesting it is that the Hantemirov data in green, diverges from the CRU 2008 “Hockey Team” data in red. This is due to a larger data sample. One tree core, YAD061 is responsible for most of the difference, when a small set of tree core data is used. This graph demonstrates how trees simply don’t show a hockey stick shape when all of the data is used. In MBH98, your paper Dr. Mann, has a similar problem to the Briffa data. Your solution was to not use tree core data after 1960 and to splice on the instrumental temperature record to in effect “hide the decline” of the trees after 1960. How do you respond to the charge that the tree ring data was cherry picked to show a desired result, and that Mr. McIntyre has falsified your work by showing that the premise of a hockey stick falls apart when all of the data is used? He responded that it was Bradley as coauthor, and his (MBH98) work did not use the Briffa data. Said the decline or divergence is well known but not understood, so is being studied. Basically dodged the question; called it “specious”. He said the warming is real and he addressed all this in his book. It was hoped that Steve McIntyre would have provided a question for submission, but there was no email response from him in time. The following is the presentation I made on April 17, 2012, to the Southern California Section of the American Institute of Chemical Engineers (AIChE), at their monthly dinner meeting held at Long Beach, California. The title for the presentation is “What if the Warmists are Wrong? Is Catastrophic Cooling Coming? Implications.” My heartfelt thanks to Mr. Alan Benson, chair of the Southern California Section, for the invitation to speak. I also appreciate those who attended, and especially for their questions. As always, it is an honor to address AIChE members. The presentation was approximately one hour, followed by another hour of questions and answers. The presentation is in three parts, as suggested by the title: 1) Are the Warmists Wrong? 2) Is Catastrophic Cooling Coming? and 3) Implications. Background: this topic could easily require a week to present the many aspects and interesting details. With a mere hour at my disposal, this presentation necessarily hits only the major points. My purpose here, firstly, was to inform the audience of what has transpired in the climate science arena in part 1, primarily as to the quality of the data and the climate models. It is important to note the scarcity of agreement between the model projections and actual data. Secondly, my purpose was to present the case for imminent global cooling in part 2. Thirdly, my purpose was to describe a few of the many and serious implications for imminent global cooling in part 3, tying this in to what engineers can expect. Engineers are problem-solvers, and this presents a great many problems to solve. I also described a few of the legal ramifications of imminent global cooling. Full presentation here, well worth bookmarking. UPDATE: 11:40AM I’m told via telephone that a local TV station is going to be interviewing Dr. Mann, and also Mr. Sowell due to his question. He promises more details later. Stay tuned. UPDATE2 11:55PM: I wrote to Roger Sowell, after getting the above message, he reports Mann ducked the interview with KOCE-TV, the PBS station in Southern California. When Mann can’t even appear on warm-friendly PBS, you know he’s on the run. My pleasure. This has been noteworthy. Dr Mann refused the interview, and according to the reporter, he was extremely rude about it. My interview went ok, I believe. I’ll post that interview if it becomes available online. Sounds like it was the wrong question to ask. You need to figure out something Mann cannot dodge away, if that ‘something’ exists that is. Every public speaker has a set of canned responses anyway. The response was truly worthy of a Manniac. So which cards are Briffa and Bradley in a game of three card Monte? You need to figure out something Mann cannot dodge away, if that ‘something’ exists that is. Every public speaker has a set of canned responses anyway. Global cooling has far greater dangers to humanity than global warming – crop failures, economic depression, and famine. See the consequences of the Little Ice Age. e.g., about 1/3rd the population of Finland perished during the Grea Famine of 1695-97. Neumann, J., S. Lindgrén, 1979: Great Historical Events That Were Significantly Affected by the Weather: 4, The Great Famines in Finland and Estonia, 1695–97. Bull. Amer. Meteor. Soc., 60, 775–787. Overall, on average, global temperatures climate has been declining from the Holocene climatic optimum as we head towards the next glaciation. Central planning bears equally large threats. Mao’s “Great Leap Forward” caused 36 – 45 million million deaths from famine, with a similar number of children not born. This caused a major dip in global population. Sorry, I’ve read here that the algorithm used would create a hockey stick graph no matter what you plugged into it. I recall a posting here of a climategate email where even one of the team described creating random data in Excel and feeding that in and generating a hockey stick graph. Wasn’t he crowing that his, what, 12 year old daughter could do a better job? Now you’re saying the algorithm is valid but the data they used was insufficient and cherry picked. Ok, which one is it? The question is unimportant. What is important is that where ever Mann goes he knows someone could be there with that killer question, the organises know, the audience know. The question posed to mann should have been, ” Have you stopped falsifying data sets?”, answer yes or no. Pardon my ignorance on the details, but I don’t understand why this question was asked of Mann instead of Briffa? As I understand it, Mann didn’t use tree ring data to construct his hockey stick. He replaced the tree core data after 1960 with the instrumental temperature record to “hide the decline”. So his hockey stick shape after 1960 came from the instrumental record. So how does the fact that “trees simply don’t show a hockey stick shape when all of the data is used” connect to Mann when he didn’t use trees to construct his hockey stick in the first place? Do you understand my confusion? I’ve read several articles on this, including some by Steve McIntyre, but they all seem to assume the reader already knows the connection of the tree ring data to Mann’s hockey stick. Is the connection too complicated to summarize and that’s why these articles leave it out? I would be surprised if other novices besides me are not confused on this point. Perhaps someone can explain (or provide a link that explains) how the tree data connects to Mann’s hockey stick given that Mann did not use tree data for the hockey stick part of his graph. This isn’t about the algorithm used, which you’re right would produce a hockey stick shape from multiple data sets, basically no matter what data was used. What’s discussed here is the raw data set, not the algorithm or its output. There is one tree in particular that has a hockey stick shape in its raw data, and by over representing that tree, you get that red line in the graph. When you use all the raw data, and graph the raw data, you get no hockey stick shape what so ever. This is nothing to do with the algorithm, which is a separate issue -on top- of this issue. Dr. Mann, suppose you became aware of an impending natural disaster, say something like a volcano erupting in downtown New York City. 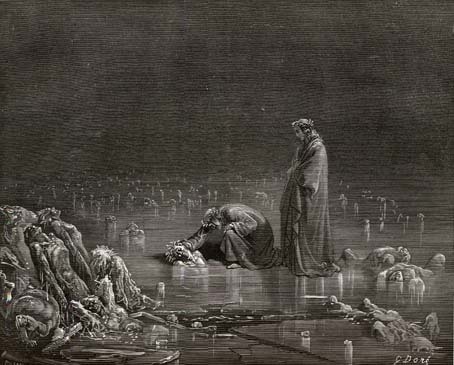 If the authorities were reluctant to evacuate millions of people on your say so, would you share with them data and scientific analysis that led you to your conclusion, or would you just let those millions of people die? I have a step-daughter who lies incessantly and, for years, it’s only her mother and I who would call her out – everyone else accpeted her version of things because she’s good at it. Recently she’s gone a little too far and others are starting to wise up. As they do there’s a snowball effect and she’s losing her credibility faster than any of the individual “gotchas” would warrant. I’m thoroughly confused by this statement…………. The deception is layers upon layers. Mann’s mannipulation of the data would produce a hockey stick using random noise. On top of that, handling the data he chose to use (more tree rings were available) in an honest manner would still produce a hockey stick because of just one atypical tree ring. Leave that one tree out and use all the rings and the hockey stick disappears. (He tried again with corings from a lake but handled them as honestly as he did the tree rings.) Besides, tree rings are lousy proxies for temperature to begin with. Layers upon layers. In answer to Louis, I would say that the fact that the tree rings did not show the warming of the 1980’s and 1990’s suggests that they are not a reliable guide to past temperatures. It is this that he was hiding as much as anything. I should add that he wasn’t just out to make the future look hotter, he was out to change the past. I think Mann might have actually slipped here. Every time I hear an AGW advocate discuss “hide the decline” on TV, the talking points are always drivel about how the emails were taken out of context, there’s no “trick”, nothing unusual going on, etc etc. I could be wrong, but I’ve never seen one publicly admit to anything being “not understood”. Hurrah!!! Another public opportunity for a quid pro quo comparison of the data and analysis, as well as to assess the integrity of each presenter adherence to unbiased, honest science…. or not! Thanks for posting the link to Roger Sowell’s SoCal AIChE presentation! I’m told via telephone that a local TV station is going to be interviewing Dr. Mann, and also Mr. Sowell due to his question. He promises more details later. Stay tuned. They do not end in 1960 and they do include tree rings. You can search for this quote on Climate Audit and elsewhere for further analysis of this statement. I noticed that too. Mann would look pretty silly trying to assert that the divergence problem is not understood and also that the trees are an accurate proxy for temperature. Then again, the notion that tree growth responds exclusively to temperature is pretty silly, and he’s gotten away with that. And he got caught using an algorithm that sifts the data looking for hockey stick shapes and emphasizing them over the rest of the data which is pretty silly too, and got away with that as well. And it would be pretty silly to graph temperature data onto a graph of tree ring data to “hide the decline” in the tree ring data because it would be so easy to get caught. Wait… he DID get caught… and got away with that as well. There’s no words to describe the debate anymore, none. As always when Dr Mann is looking like the charlatan he is, the paid trolls come out of the woodwork with “warnings” and handy quotes and links to articles on charlatan friendly sites. Sorry DR_UK, I read the climategate e-mails, I looked closely at those graphs, and I read the excuses after the fact trying to justify that they did exactly that. This was what Phil Jones was reffering to as “Mike’s Nature trick” in the climategate emails, and the fact that various researchers tried to JUSTIFY what they did instead of claiming that they didn’t tell me all I need to know about this fiasco. When Wile E Coyote breaks the law of physics, why does he get away with it until he faces the camera and the audience laughs? Before he crashes and burns. If he were so wily, why run off the cliff in the first place ? Let me put my question to you, DR_UK. If you were a scientist who, in the course of your research, became aware of an impending natural disaster, only days away, that would kill millions of people, would you disclose your data and methods to the public in order to convince them to take action? If Roger is bringing light to the AIChE, good on him. As a member, it is maddening to see the organization diving head first into the CAGW pool. If I see a yet another promo for a webinar on CO2 sequestration, I may throttle someone. The question to Mann is surely …. It must be hard for the egotistical Mann, your desperate for any sort of lime light to stroke your ego but every time you appear in public you get asked awkward questions. I bet he wishes he was like Al Gore and could just charge £100,000 and then just leave. But for the most part, it is a perfect dodge. Sounds “smart,” sounds like scientists take it seriously, plays upon “hope” in the future. But it’s a trick. He can front his bad info that doesn’t take into account the divergence, and still present it as good science, and shore up negatives by kicking them down the road. Or the current favorite, “the bureaucracy we created was supposed to do that.” E.g., the Volcker Rule so much in the news, which the Democrats faked supporting by a kick the can maneuver. These tactics work because people fall for them, i.e., the US media who actually believe the Demo. party supports the Volcker Rule. Five or six thousand votes [it closes on Monday 21st at 8 pm [I guess Sydney time, so about 0800 or 0900 GMT/UTC]] is hardly representative of even the twenty-five or so million Australians. But – almost half of all votes are dismissive, with more than a sixth of the rest being doubtful. I feel that The Team is now facing the possibility, at least, that their silver-tongued eloquence has not been uniformly successful. Is it possible that there was a Medieval Warm Period? Or a Little Ice Age [at least in much of Europe]? Best regards from a damp London Town [still in the death grip of the wettest drought in history]. This is a gentle plea to all preparers and presenters of graphical data. Please consider using red and green ‘line’ and ‘point’ colors judiciously, when graphically plotting data. I am afflicted with red/green color blindness, as is some 6 percent of the male population and less than 1 percent of the ladies. This affliction can range from mild impairment in discerning shades of either red or green, to complete inability to see either or both colors as anything other than shades and intensities of grey. If you can plot your data effectively, without using either red or green colors, please do so. If you need to use red and green, choose the boldest color of each (no pastels) in your graphical plots and use larger line or data point sizes, to give us ‘6 percenters’ a fighting chance at comprehending your communication! No way would Manny take a chance that an interview would become a debate with a knowledgeable science oriented questioner (being an engineer is a megabonus and Manny would have looked the fool, accurately). Why does a quickly “hoovered” ice cream soda send bubbles to my brain? >>How interesting it is that the Hantemirov data in green, diverges from the CRU 2008 “Hockey Team” data in red. I agree. It would be regrettable if Mr McIntyre had, in his haste to get a ‘non-hockey-stick’ graph into the discussion, failed to do exactly the kind of due diligence and detailed work on the provenance of the data that he demands of others. I wonder what Rashit Hantemirov, who collected, curated and published the data from which Mr McIntyre’s plot is based, makes of it? Steve, I’m horrified by your slipshod work. You did not define what you compare, what dataset used in each case, how data were processed, and what was the reason for that, what limitation there are, what kind of additional information you need to know. Why didn’t you ask me for all the details? You even aren’t ashamed of using information from stolen letters. Do carelessness, grubbiness, dishonourableness are the necessary concomitants of your job? Perhaps Steve could be interviewed on the TV to explain himself? Please see Mike’s Nature trick. I guess it depends on what the definition of “grafting” is. See also this where Jones first admits the deception, then the admission is removed. Second, simply deleting the proxy record after 1960 (the “declining part”) would still leave a downward curve that would clash with the instrumental record plotted on top of it in the spaghetti graph that became know as the hockey stick. Jean S in the first referenced post on CA explains that instrumental data was padded onto the end of the proxy data, so that the smoothed curve would now point upwards. In some earlier work though (Mann et al, 1999), the boundary condition for the smoothed curve (at 1980) was determined by padding with the mean of the subsequent data (taken from the instrumental record). This does make a small difference near the end of the series. It doesn’t effect any of the conclusions drawn in the paper though. First, notice that Jones talks about “adding” temperatures to data not “plotting along” as the “group” misinforms over RC. “Adding” is exactly what Jones did: he took the reconstructions (three of them; listed in the figure caption) until the final years, added the instrumental temperature from that on, and then smoothed this with end point padding. In other words, he “grafted the thermometer record onto” reconstructions. Second, notice that Jones writes about adding temperatures to “Keith’s” and “Mike’s” series. So there is “a decline to hide” in both series. If Jones was talking only about “Keith’s series” (as RC claims), he would have likely chosen the word “divergence” instead of “decline”. Third, gavin is right in that only reconstruction (without any padding!) was smoothed in “Mike’s Nature paper” (MBH98), but “Mike’s trick” (adding real temperature to reconstruction before smoothing) was actually used in “Mike’s GRL paper” (MBH99), which contains the series commonly referred to as the “hockey stick”, and more importantly here, is plotted in Jones’ WMO figure. So “Mike’s Nature trick” is actually slightly a misnomer (should be “Mike’s GRL trick”) from Jones’ part, but I do not blame him for that. Here is another explanation of Dr. Mann’s grafting of temperature data onto proxy data that summarizes things on one web page. All your points are well taken, I only offer an additional conclusion–has anyone actually inquired “what” the “instrumental record” appearing on the spaghetti graph actually is? I was at the conference. Mann’s presentation was smug and dismissive of any contrarian thought. His complete dodge of the question was obvious to all, and all the people I talked to thought little of Mann going in and less of him going out. I spoke with one of the conference organizers about what it was like to get Mann to agree to speak and she just shook her head and said, “I’ll have to tell you about it later.” Another organizer told me Mann would only agree to speak if there was a guarantee no one opposing his position would be on the panel. The other panelist was from Pacific Gas & Electric, and explained how the utility is planning for the complexities of cap and trade and other foolishness (my word, not hers) related to AB 32, California’s Quixotic climate change legislation. When asked how much it was costing PG&E to do all this, she demurred. When asked if it affected the bottom line, she said no … then added “It’s a customer impact” … in other words, they pass through, we pay. And California already had the highest electricity costs in the nation before this latest round of insanity. I was at the conference and Mann’s dodge was apparent to most in the audience and a surprise to none. All I spoke with afterwards discounted him and scoffed at his woosiness. Also, I talked to one of the organizers who just shook her head and said, “I’ll have to tell you about it later” when I asked her about the details of getting Mann to agree to speak. Another told me later Mann would only appear if the event organizers promised there would be no opposing voice on the panel. The other panelist was a utility person (Pacific Gas & Electric) talking about all the work they’re doing to address California’s AB 32 global warming legislation and cap and tax. When asked how much all that regulatory compliance and carbon credit purchases was going to cost, she demurred. When asked if it affected the PG&E’s bottom line, she said no. Then added it was a customer impact – in other words, ratepayers are paying for it (however much it may be), not the utility. California already had the nation’s highest electricity costs before this foolishness started. Mr. Mann should be in jail just for the damage he has done to my PSU Science degree AND being a rude son-of-a-gun. It is known that the Piltdown Mann has been caught in a lie, but it is not understood yet. Sorry, I’ve read here that the algorithm used would create a hockey stick graph no matter what you plugged into it. No! The algorithm can produce a hockey stick shape with arbitrary data, but does not always. A distinction worth noting. I recall a posting here of a climategate email where even one of the team described creating random data in Excel and feeding that in and generating a hockey stick graph. Wasn’t he crowing that his, what, 12 year old daughter could do a better job? Dunno, but it is irrelevant. No! In reality, the algorithm is valid but only when the data meet some rather stringent requirements. Arbitrary data that do not meet these requirements can, and often will, produce spurious results using PCA, and such an expectation is increased when data are selected using post-hoc methodologies. When the data are thusly cherry-picked, it is impossible to make any legitimate claims. What is being said is not what you claim, rather, it is simply “when all the data are included, the hockey-stick no longer appears,” which actually refutes the original hypothesis (the hockey stick) by glaringly pointing out that the result is specific only to a subset of the data. In other words, application of Mann’s method to this data produces results that are, for lack of a better phrase, all over the map. Neither – well, ignorance is bliss is what it is. I am maybe too cynical. i would not ask Mann about anything scientific. I would simply ask him what he saw when he last went to a cinema. His pseudo-scientific views are of no interest to me and neither are his attempted justifications. Hearing him tell me lies would not please me. His confusion at a non-threatening/supportive questionmight be telling..
As to the CRU emails, I do not know that they were “stolen”. Many people believe that they were released by someone within the University. Nor was any disrespect shown to you in the quotation from the email, which showed you in a professional light. I totally agree with standards requiring disclosure of “what dataset used in each case, how data were processed, and what was the reason for that, what limitation there are, what kind of additional information you need to know”. That’s why I provide turnkey code as much as possible. Much of my frustration in this field has arisen because authors do not do this and are unhelpful to inquiries. I’ve placed source code to generate the graphics at the bottom of the article. I regret that you you feel this way. If I can provide specific clarification on data sets, processing steps, etc, perhaps through reference to prior posts and scripts that are familiar to regular readers or through any other way, please advise me. [Hantemirov] …has to coexist with Briffa, Schmidt and those guys. I suspect that he’s received criticism for providing me with data. I didn’t do anything complicated in the calculation, so I’m not sure what his specific problem is. In addition, CRU has told Muir Russell and the public that the “purpose” of Briffa 2000 and Briffa et al 2008 was to do RCS-style calculation on a Hantemirov data set. What is the objection to doing a similar calculation on his 120 core living data set? Even if there are other worthy data sets. Phil Clarke, you are being deliberately deceptive, as anyone can see who reads the comments following the one you posted. There is even a serious question whether that comment came from Dr Hantemirov. Another organizer told me Mann would only agree to speak if there was a guarantee no one opposing his position would be on the panel. He can’t answer the hard questions and he knows it. His typical big oil conspiracy, or futile argumentum ad hominems, in response to hard questions when he is cornered, are the best evidence of that. Well, I guess the fact that nobody that understands the concepts behind his work actually agrees with him is good evidence, too, but that group would not include your typical journalist or the hoi palloi reading his pronouncements on MSNBC. If temperature and tree ring data diverge and you don’t understand it, how can you justify the assumption that the trees are proxies for temperature? Beautiful work Anthony and Roger! First I’ve heard of an author who is spruiking a book to refuse a TV interview. Especially PBS. And in California too! As an aside Simon Tumbrill of Australian Climate Madness features on the front page of The Australian paper edition this morning, the highest selling serious broadsheet in Oz. Enormous credit to Simon as he’s managed to completely pwn the national university and also the national broadcaster (both CAGW hotbeds) with just one FOIA request. Keep chipping away at them thar foundations, the cracks are getting wider and wider. Regarding whether anyone has asked Mann himself what the “instrumental record” comprises of, take a look at MBH 1999. All it says is “raw data.” That is— “Figure 3. Millennial temperature reconstruction. (a) NH reconstruction (solid) and raw dated (dotted) from AD 1000-1998”. Actually, the “raw data” is red colored, not dotted. Anyway, Not what Jones thinks, or the IPCC thinks, or anyone else, has Mann himself explained what this “raw data” is and where it comes from? I’ll probably get banned for life from WUWT, but here is a reference from Wikipedia. Phil Clarke still can’t believe the math makes hockey sticks, and that those Magically Accurate Treemometers aren’t real heat sensors. and Carbon Sin offends the Magic Angry Gas that builds up all that Magic Infrared in the atmosphere. That the infrared astronomy field can’t find. Hey Phil: see that light at the end of the tunnel in all this? That’s Darwin’s Dogs rear end, and the deposition of your Magic Gas is going to be in the same corner of the internet, he deposited Area 51, Bigfoot, and Elvis@Kmart. I agree with David. Imagine you discovered or believe you discovered a complex phenomenon involving multiple scientific disciplines. Further, assume that the phenomenon would harm all mankind. Finally, assume that you believe you have a solution to the impending disaster, but to be effective that solution must be implemented immediately. What would your response be? (1) Sound the alarm and present all of your data/methods without reservation to the scientific community at large, and ask that community to either confirm or hopefully (who wouldn’t hope the world isn’t headed for disaster?) refute your findings. (2) Write papers to your aggrandizement; publish them in friendly journals; share data only with sycophants and accept their accolades (thereby making you if not the “Top Dog” at least one of the “Top Dogs”); when some of your data/methods leak to the scientific community, support the suppression of any publication that is critical of you and/or your beliefs; and spend whatever grant money you get on trips to exotic places in part to bask in your new found glory. (3) Keep quiet, go on a binge, and enjoy life while it lasts. Of these three options, IMHO Dr. Mann’s behavior clearly most closely matches number two. Thus, independent of whether or not Dr. Mann is a competent scientist, he surely can’t be called a humanitarian. PS. Although response number one is the obvious choice, given that Dr. Mann didn’t choose number one, I believe the world would be better off if Dr. Mann had opted for number three. Man, or any of the team for that matter, would be outright fools to ingage in any exchage or debate that would lend credibility or equivelancy to the sckeptics claims. The goal posts are always moving as evidenced by the many heated exchanges by experts on this blog so point and counter points would desolve into meaningless chatter. A debate would absolutely be a loser for the team and they know it very well. Quit asking. It isn’t going to happen. Thanks for the reminder, to vote in ‘Round 2’ of the Aussie AGW oriented “Hey Buddy, Can alarmists change your mind?” poll! You’re conflating Briffa and Mann, although they did similar things. You can leave YAD061 in, there’s no reason to take it out. You just shouldn’t give it a very high weight without justification. 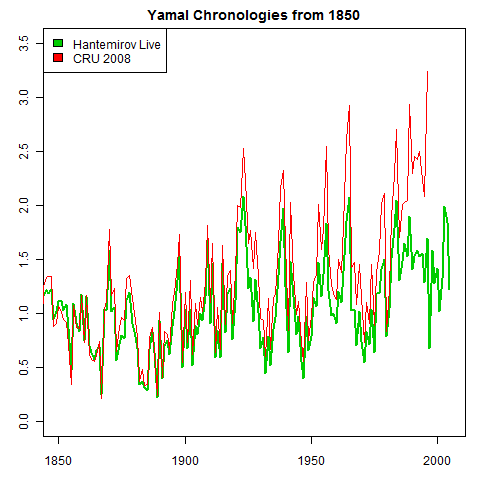 If all 10 of the cores used were given equal weight, there would be no HS from Briffa’s Yamal data. Phil, you devious conniver, you left Steve McIntyre’s response off of your cut ‘n’ paste. McIntyre replied to Hantemirov:…. Very Nice! You caught him in a deliberate deceit by omission, trapping him like a repugnant fly transparently displayed in amber for all to examine at their leisure. Nice!!! Your first error is the statement “assume the phenomenon would harm all mankind.” That is not the case. Your second error is the statement “you have a solution to the impending disaster”. There is no proof of an impending disaster let alone a proven solution. It is all model based with too much gigo. In addition the recommended “solution” will not change anything but will instead destroy civilization as we know it. Now, suppose you knew the Sun was going to swell to a red giant, engulf Earth and destroy it completely. Suppose your solution to this disaster is for mankind to leave this Planet and colonize someplace safe. Suppose you knew this would take thousands of years to implement. When would your response be to this? Nice try at a re-direct Phil. The subterfuge is clearly evident. The proxy reconstructions are clearly truncated at the point where the instrument record begins. It appears to the casual observer that the proxy data and the instrumental record agree. They do not. The proxy data declines in opposition to the instrumental record, and that is why it was truncated at the point of decline, so that nobody would see that the trees do NOT mirror the temperature record after all, except for one short time period. If they cannot mirror the temperature for decades at a time during the temperature record, there is clearly no reason to consider them accurate for the other 900 years of the reconstruction. I had heard Mann was selected to lead the charge against “Deniers” and other denizens of pure scientific thought. Apparently they didn’t select someone with sufficient backbone. That decline is certainly difficult to hide. As a matter of interest, what is being measured in the red/green graph? The ordinate needs a label if us non-dendroscientists are to make any sense of it. I think we’re on the same side. I believe (as I think you do) that (a) a little bit of global warming will not harm mankind, (b) there is no impending disaster, and (c) the solution proposed by CAGW proponents to reduce carbon emissions back to some level in the past will cause more harm than good. However,you said that my “…first error is the statement “assume the phenomenon would harm all mankind“. How can an assumption be an error? A conclusion can be an error; but the only way an assumption can be an error is if it is internally inconsistent with other assumptions. Maybe I’m wrong, but I don’t think my assumptions are internally inconsistent. I was trying to show why independent of Dr. Mann’s scientific abilities, his behavior was and is in opposition to man’s best interests. To answer your question, if the “sun’s swelling to a red giant” will occur in a time interval short compared to our ability to leave this Planet and colonize someplace safe, I’d enjoy life to the fullest while it lasted. If we have time to leave this Planet and colonize someplace safe but we don’t have any time to waste, then I’d say we shoulld make the attempt. If we have a billion years before the Sun becomes a red giant, then at this time I wouldn’t spend any extra effort to decide how to address the problem. I’d wait at least 500 million years before giving the matter much thought. Dr. Mann has done a lot of great work, and has advanced the field of paleoclimatology even since he was a recent post-doc. But he’s not a politician, he’s a computer geek. Being vilified by people who don’t like the science for political reasons was never in his job description. I wouldn’t expect or tolerate being hounded at Disneyland either. He has however, contributed much to the field, and he is a hero of the climate wars for the science team. You have got to be kidding? I’d buy the computer geek thing if he ever actually demonstrated an understanding of them, but even there his competence is arguably non-existent. Mann has done more damage to science than any hack in recent memory. He is, at best, a physics school dropout. Read Roger Sowell’s presentation, excellent work. Then tried to leave a comment but his Captcha just does not let you in even if you type it right. He leaves no email either so there is no way to contact him. Then I shall put to you the same question that I put to DR_UK who also spoke in Dr Mann’s defence. DR_UK hasn’t responded, maybe you are made of sterner stuff. This is just sad. If any of you truly have a scientific case against Dr. Mann’s work, submit original research to a journal. You’ve made that silly argument in several threads and been mocked for it repeatedly. Science doesn’t have to appear in a journal to be credible (just ask the patent office) and appearing in a journal doesn’t make something credible science either. Can you come up with some new material? But while we’re at it, since you so adamantly defend Dr Mann’s science, could you please answer the question that I put to both Seth and DR_UK with no response from either at this point? I read your post to Phil. I read the Climate Audit postings linked and related. Here’s my problem. McIntyre assumes Mann means thermometer records when Mann supplies the term “instrumental record.” in M1998. In 1999, Mann uses term “raw data.” It seems everyone thinks Mann is less than straight when he says a “thermometer record” is NOT grafted. Well, maybe his “raw data” is not a “thermometer record” at all. My question, Has anyone inquired what Mann means by “instrumental record” and “raw data.” Whose data? What source? Who compiled it? What’s truely sad is that fact that the well documented, despicable behavior on the part of Mann and others has led to internet blogs being more credible than certain peer reviewed journals. And if there is no scientific case against him, why did he duck the interview? Why stipulate that no one who disagreed with could be on the panel? When was the last time he was in a debate? Not sad at all, “otter”. We don’t need some Team-infested journal to tell us what Mann wants us to think. The graph at the top of this thread with the two colors (green for reality; red for Mann’s fantasy) is sufficient-that is, unless you’re color blind. What’s sad is you’ve apparently been sucker-punched by The Team, promoting The Cause, to make Big Payola (for them–you get to pay, and worry, and fret, and in the end feel foolish). Mann can not live by cred’ alone. Thanks, Anthony, for posting my small part in this rather interesting episode. I appreciate the link to my little blog, too! The Orange County Water Summit was actually quite interesting, as water is also a favorite topic with me. Regarding the question I asked, I tried to stay as close to the two short paragraphs as stated in the body of this post. I wrote it out on a piece of paper, and read it when my turn to ask arrived. “My question is for Dr. Mann. Dr Mann, in your 1998 paper co-authored with Dr. Briffa and Dr. Hughes, you showed a warming since 1960. The same hockey-stick graph was shown earlier today. However, you chose to not use tree core data after 1960 but instead to splice on the instrumental temperature record to in effect “hide the decline” of the trees after 1960. Mann then proceeded to state that my question had false information, since it was Bradley, not Briffa as co-author. OK, we can grant him that small point. He went on to say, as I emailed Anthony and shown in the post above, the decline is well-known but not understood; research is on-going; then dodged the question and called it “specious;” then made a plug for his book (about the third or fourth time, I believe) saying the warming is real and he addressed all this in his book. There were a couple of other questions from skeptics, one related to Dr. Richard Lindzen of MIT. Mann replied that Lindzen is a maverick, and that the consensus is what we follow in science. He stated that we don’t believe in Evolution theory simply because Darwin proposed it, but because it has withstood the test of time and many scientists’ verification for more than 100 years (I think I have his answer pretty close to verbatim). Now, about the Nobel-prize: Mann stated at the outset that he did not win the Nobel prize, and explained that he merely shared in it as a contributing scientist to the IPCC, which organization did win. I actually enjoyed Mann’s presentation, because it reminded me a bit of being in a final exam in university, where the goal is to spot the errors, omissions, and misleading statements. Mann’s presentation was full of such things. For example, he showed a graph of Arctic ice decline, during a segment on the many threads of evidence that proves the globe is warming. His graph stopped at 2007, at the lowest point in the record. He did not explain that the graph was for summer minimum extent, which I think it must have been. That cherry-picked endpoint made the graph take a dramatic downward trend, and was most impressive. And, very misleading because the minimum extent has stabilized and slightly increased since then. Another was the latest 12 months in the USA being the hottest 12 month period on record. No mention of Europe or Asia, though, which just ended brutally cold and bitter winter.. Again, misleading. Another was the intense rainfall on the East coast from hurricane (or was it tropical storm?) Irene. Mann stated that the intense rain was due in part to global warming, since the Atlantic Ocean was unusually warm when Irene passed over it and collected water vapor to dump on shore as rain. That raised my suspicions, since I have never heard that before; perhaps it is true; I just don’t know. He also presented a graph to show how superbly well the climate models match the actual temperature trend since Dr. Hansen made his speech to congress in 1988. What he didn’t mention, though, is that the “actual data” has been severely manipulated and approximately half the warming is due to adjustments. His “actual data” also either 1) stopped before the recent leveling off, or 2) showed a warming for the past 12 or so years; I could not read the time-scale on the chart from my seat near the back of the room. Either way, that was (again) very misleading. Finally, he showed the (is it obligatory?) photo of a polar bear on a tiny ice floe. He spent some time talking about his little daughter and how he wants to leave a good world for her. The polar bear on the ice floe was displayed during this portion of the speech. Again, extremely misleading since polar bears have plenty of ice on which to sit, and their numbers are growing, not declining. Mann tied in global warming to the water topic, saying the models forecast a much more arid climate for the US southwest. This, of course, will make the existing water shortages in California and other Western states much, much worse. He then confused us all by saying it was not clear if more La Niñas or El Niños would prevail. He noted that global warming creates warmer oceans, which would mean more El Niños, which almost always bring more rain, not less. I must note, here, that the existence of multiple models, as Mann mentioned, is a clear indication that the science is not settled. My words not, not Mann’s, but if a person on a journey had 12 different maps, and took the average of the 12 routes and directions to his destination, one must wonder if he would reach the destination at all. Thank you to all the commenters above for the kind words on my speech to the AIChE. That speech was a lot of fun, and it was rewarding to have a few college students from California State – Long Beach in attendance. They seemed to not be aware of any of the points I made, and it came as somewhat of a surprise to them. Just a few words about the television interviews, that Dr. Mann declined and I accepted. I was asked by a very nice young lady to step out of the convention hall into the hallway, where she confirmed that I had asked the question of Dr. Mann. She then said that was an excellent question, and a news reporter from PBS would like to interview me, would I consent to the interview? I said I would be happy to do so. I met the reporter, David, and I apologize to him that I didn’t catch the last name. He’s a very interesting and quite nice fellow. We went through the preliminaries, my name, occupation, and he asked my affiliation. I told him I’m in solo practice and was here on my own, not representing any organization. That seemed to perplex him, and I stated that I am just one of many thousands of climate skeptics. Some others wanted to attend today but could not for various reasons, so I came alone. He seemed more relieved when he asked what kind of law I practice and I told him Climate Change law. David then decided he wanted to interview Dr. Mann first, then me second to get the skeptic view. He asked me to step away and return in 10 minutes. I went back to the presentation and took my seat. I could see Dr. Mann across the room, and he went out for a few minutes then returned. So, I went back out to find David and his camera-man. At that point, David told me that he did not interview Dr. Mann after all. He said, and I’m paraphrasing here, that Dr. Mann refused the interview and got angry. I believe David told him that he was to be interviewed first, then me, although I was not identified by name but by the question I asked. It could be that Dr. Mann did not want to be interviewed then have a skeptic follow him, with no opportunity to rebut. This is just speculation on my part, though. In the actual interview, David asked me a few of the questions he had intended to ask Dr. Mann, such as what is global warming, and what role does mankind play in this? I can’t recall my exact words, which should be available soon if and when the video is aired and placed on-line, but here is what I believe I said. 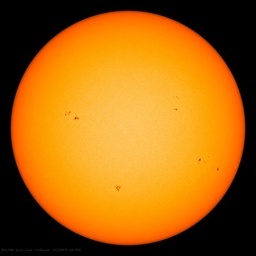 I said that global warming is the fact that the world has warmed somewhat, perhaps one degree F, in the past 150 years. The cause of the warming is mostly natural forces, since mankind has not placed much CO2 in the air until the past four decades. He asked other questions, such as what is the skeptic view. I told him that I don’t believe that CO2 causes much, if any warming, and that the more important issue is global cooling due to the weak solar cycle. David ended by asking why I thought Dr. Mann was so rude in his refusal to be interviewed, and I replied that I don’t know, but I do know he is party to some litigation. It is possible his attorneys have advised him not to do interviews. This is a pure guess on my part. Your side should then get Mann to fight his battles in Tron rather than on the world stage where deep-thinking critics don’t suffer fools gladly. But your comment about being “vilified” is a dodge as bad as Mann’s: the above graph is not a political statement at all but shows without controversy that he was WRONG! Might I also point out it uses data in the field in which Mann claims to have expertise and was also computer generated so if anything his geekiness should be an asset. Apparently your definition of “vilified” is when someone proves him wrong. Well, using that definition, Mann is the Villain of Villified–and in his own scientific realm, yet; a much more appropriate job description than the accolades you’re applying. Since this was a Water Summit in California, much was made of the forecasts of sea level increase. The particular focus of today’s conference was the California Delta, where two major rivers meet, and then flow into one channel into San Francisco Bay. The two rivers are the Sacramento (flowing from the north), and the San Joaquin (flowing from the south). What struck me was the blatant statement that sea level would rise 55 inches (1.4 meters) by the year 2100. That statement was not challenged by anyone, as far as I could determine. The mid-century mark was to be about half of that. The point was made that the Delta region has many miles of levees, with only approximately one foot freeboard at high tide presently. Therefore, something must be done to all the levees before the sea level rises 55 inches. This is important, because the dry land behind the levees has subsided, in many places as much as 30 feet below sea level. All of that land is subject to flooding, permanently, if the levees are not modified to increase their height — and the sea level does indeed rise. That amount, 55 inches, is far beyond what I recall as the most likely prediction, even from the IPCC. Rockroad wrote:Apparently your definition of “vilified” is when someone proves him wrong. No, I mean how in venues like this he gets “Mann has done more damage to science than any hack in recent memory. He is, at best, a physics school dropout” – Mark T above. Mann was awarded the Phillip M. Orville Prize in 1997 for an outstanding dissertation in the earth sciences at Yale University. His co-authorship of a scientific paper published by Nature won him an award from the Institute for Scientific Information (ISI) in 2002, and another co-authored paper published in the same year won the NOAA’s outstanding scientific publication award. He was named by Scientific American as one of fifty “leading visionaries in science and technology.” The Association of American Geographers awarded him the John Russell Mather Paper of the Year award in 2005 for a co-authored paper published in the Journal of Climate. The American Geophysical Union awarded him its Editors’ Citation for Excellence in Refereeing in 2006 to recognize his contributions in reviewing manuscripts for its Geophysical Research Letters journal. Mann’s work and that of several hundred other scientists who contributed to the IPCC’s Third Assessment Report received recognition with the award of the Nobel Peace Prize in 2007. In 2012, he was elected a Fellow of the American Geophysical Union. He was awarded the Hans Oeschger Medal of the European Geosciences Union in 2012. Btw, Building miles of levees with only 1′ of freeboard seems like it was at bad engineering decision to begin with to me. I wonder about the rest of the story there. davidmhoffer wrote: Science doesn’t have to appear in a journal to be credible. There are over 100,000 scholarly papers in the field of climate science. There’s plenty of controversy in the peer reviewed literature. If someone’s claims (such that proxy temperature reconstructions are wrong) don’t appear in the literature, then it’s a fair assumption that they’re more crackpot than science. It’s a generalisation, but the best use of your time would be to read the peer reviewed literature first. The other advantage of the peer reviewed literature, is that the scientific community would have read it, and you can find their response or lack it. 1) Mann’s data is available. 2) Mann’s work has been paleoclimatology, not any impending effects. He’s looking back in time, not forwards. I imagine not, I expect that I would be busy making my own preparations. Chill out dude. We are not in disagreement. I just couldn’t find what I was thinking of (which was your link) and so used Wikipedia, while expressing my dissatisfaction at that source. However, I think the particular answer to FTM as to what “raw data” had been plotted was fairly close (he seemed to doubt that a temperature index had been plotted). Thanks for finding the link to the spaghetti graph. That links complements my previous links very nicely. UPDATE: Your link was embedded in my first link. Au contraire, mon ami. As shown in my first comment, the instrumental record was clearly grafted onto the proxy record in the WMO graph with no indication of that “trick.” That point was conceded with the excuse that the caption was incorrect. However, I am in agreement with you that the sum total of what he did goes far beyond that. UPDATE: A further clear example of a splice of instrumental data onto the proxy record by Dr. Mann is at MBH98 Figure 7. TomB, you seem to have a problem understanding the basics. GED’s response is a good one. Re-read it. Nobody said Mann’s algorithm is valid. You are mixing apples and oranges, raw data versus algorithmic garbage. A Question: What is the difference between Bing Crosby and Walt Disney? An Answer: Bing sings. Walt Disney. Problems with ‘mann’s data is ‘available’,’ aside, You just gave the Perfect reason why the junk science movie ‘The Day After Tomorrow’ should never have been made! Phil Clarke says:May 18, 2012 at 2:43 pm “Perhaps Steve could be interviewed… to explain himself?”……..
Smokey says:May 18, 2012 at 3:50 pm Phil, you devious conniver………….. It isn’t an argument, but a challenge. Can you actually put together a formal body of research and submit it through the scientific process? The way the scientific process has worked since the days of Isaac Newton and the founding of the Royal Society goes something like this. Peer review catches methodology/accuracy errors and should bring the research and presentation of the paper up to a journal’s standards. Rebuttals provide a means for submitting evidence to the contrary of other papers. When certain hypotheses and collections of papers become cited, further reinforced by research, or built upon in other ways, a body of research pointing towards a theory begins to take shape. The scientific journals have been the proving ground for grand scientific ideas and subjects such as evolution, astronomy, electro-magnetism, etc. When you have several reconstructions using other paleo evidence that reinforce the Mann et al reconstruction, it is an indicator of where the science is coalescing. When you have complaints concerning those lines of evidence on a blog, it doesn’t say much in the scientific sense. It is completely reasonable for someone to be skeptical of notions that are NOT sent through the scientific process. Lay people that decide to uncritically accept notions that have not gone through this process, yet discredit notions that have been proven in the process, are clearly exhibiting behavior that is non-skeptical. Unfortunately that method doesn’t work any more. Look at what happened to the head of the Italian neutrino project. He came up with a result that seemed wrong, but couldn’t determine where his error was. He did (1) exactly: opened up everything to the scientific community, which then worked on the problem in a remarkably honest way. And what did he get for it? Got fired. In most parts of the “scientific” establishment, option (2) is the only way to keep your job and reputation, the only way to stay in the game. The problem is much larger than Mann. He’s an outstandingly awful product of the system, but the system will always produce more Manns. Real science must be done outside the system. otter17 knows nothing, he’s just winging it. Peer review is not important. The scientific method is what maters, and the scientific method requires complete transparency of all data, methodologies, metadata and methods in order to replicate experiments and validate or falsify hypotheses. Michael Mann’s cherry-picked ‘reconstructions’ are not science, they are runaway global warming propaganda intended to advance Mann’s alarmist narrative, and otter17’s credulous belief in Mann’s pseudo-science puts him squarely in the lemming category. Well stated. Madame Sklodowska-Curie and Pierre Curie would agree. As would other scientists. Thank You Roger Sowell and Anthony. Why am I not surprised that Mann ducked the interview? I do not think he is capable of holding his own against anyone of above average intelligence armed with facts and he darn well knows it. You can not appear to be an all knowing “Godlet” if you are shown to be a buffoon in public, hence he ducks any chance of that happening. ….He has however, contributed much to the field, and he is a hero of the climate wars for the science team. You forgot the /sarc tag Seth. What Mann and “The Team” have done is dragged the reputation of science and scientists in the mud. As a chemist I became so disgusted with the bandwagon following the team I quit both professional societies I was a member of for decades. When all the dust clears and the next cooling period hits with a vengeance, which it will, the team will leap ahead of the perpetrators of the Piltdown Hoax as the worst science hoax in history. At least with the Piltdown Hoax they were not trying to siphon off the wealth of an entire civilization before they killed it dead. Mann reminds me of this guy. He’s nothing but a humbug. No wonder he doesn’t want to answer a reporter’s questions. otter17~When you have complaints concerning those lines of evidence on a blog, it doesn’t say much in the scientific sense. Wrong on Every count, bub. Seth: I don’t know if you chose your nom de plume, but it is very appropriate, as it describes your comments AND Mr. Mann to a T.
….It isn’t an argument, but a challenge. Can you actually put together a formal body of research and submit it through the scientific process?…..
Research has been submitted as I told you before. If it does not have the “get out of peer review free card”, a statement like “This research in no way contradicts the theory of man made global warming”it gets kicked into a black hole. Caspar and the Jesus paper is one example. Editor-in-Chief of Remote Sensing Resigns from Fallout Over Our Paper is another example. I lost the reference but Dr Jaworowski was refused funding when he wanted to look into CO2 measurements done in ice cores and whether they were valid. I found another reference, a PDF you should read in full. Until now such a scrutiny was not done. A project on such experimental study in Norway was dumped before it started in 1994, because it was defined as “immoral” by a high rank governmental bureaucrat (see Chapter 7 in: (Solomon, 2008). I am not going to go hunt down the e-mails that validate that gate keeping was in full force by the team. They are address in old WUWT and I will leave hunting them as an exercise for the reader. You want papers that support an alternate view? Pop Tech has been kind enough to make a listing. Please note the papers often have the “get out of peer review free card” in them so they would be published. No scientist wants to commit employment suicide by not echoing those who hold his career in their hands. Therefore it is the body of the study that matters. I am not actually answering you but addressing the fence sitters. You keep answering and I will keep answering because the truth will sway the fence sitters. I figured there woulde be some way to weasel out of the issue and Seth found it. He wouldn’t even TRY to save a few million lives by warning people of the impending disaster, he’d just save himself. What does that say about Seth? But if we presume that Seth’s attempt to wiggle off the hook is a credible answer, we should then consider if the “Team” is perhaps behaving in the same manner and protecting themselves from the impensing disaster that they are predicting. Are they buying property in northern climates? Are they seeking citizenship in northern countries? Are they taking steps to ensure that what little patches of earth are left that are suitable for human habitat after the dreaded CAGW ruins the planet will be reserved for them, their children, and their grandchildren? No they are not. Al Gore recently bought beach front property for crying out loud. Why would he invest millions in something he says he is certain will be drowned by CAGW? So…. we have Seth, who wouldn’t even bother to warn the rest of us, and the climate scientists who warn us on a daily basis, but won’t explain for certain how they know, and are taking zero steps to protect themselves and their children from the disaster they claim is certain. Thank you Roger, and good comments Smokey and Gail. The problem is that the extreme left has adopted Global Warming as a sacred “Cause”, to be defended by their brown-shirts with vehemence and violence against all intellectual challenges. The history of eco-extremism is capably described in this essay by Patrick Moore, a co-founder of Greenpeace. It is no accident that Moore wrote this in 1994, five years after the fall of the Berlin Wall. The scientific failure of the global warming alarmists’ case is evidenced by the utter failure of their predictive record. Not one of their very-scary global warming predictions has materialized. There has been no net global warming for 10-15 years, but this does not deter the global warming fanatics – the shepherds just change their story, and the sheep just follow. “Catastrophic Humanmade Global Warming” morphed into “Climate Change” and is now mutating into “Sustainability”, but it is still the same old Cause – a scheme to gain economic and political advantage by scaring the gullible pubic, and then promising to “deliver them from evil”, if they will only follow the self-serving dictates of the high priests of the Cause. In the last few decades, advocates of the Cause have squandered a trillion dollars (a million-million dollars), mostly on failed “Green Energy” schemes that consume more energy than they ever generate, and are detrimental to humanity AND the environment. In the last few decades, this trillion dollars, properly allocated, could have provided clean drinking water and sanitation to the Third World. Since the beginning of global warming mania, tens of millions of children have died from drinking contaminated water, a multitude similar to ALL those killed in World War 2. The scientific process and journal publications are not the same thing, which you seem to attempting to assert. Journals are simply an attempt to document science and expose it to scrutiny. Really? How many journal articles did Henry Ford publish? How about Alexander Graham Bell? The list of towering accomplishments in human history that never went through the journal system is extensive. But where your position really falls apart is that regardless of how science progressed through (in part) the journal system, that was then, this is NOW. In the current state of affairs, journal editors are under extreme pressure to block the papers of skeptic scientists, and we have, in the here and NOW, one journal editor who was fired for not buckling under pressure, and another who resigned claiming that he’s erred in allowing a skeptic paper to be published though he couldn’t say exactly what the problem was that should have prevented the paper from being published. Then he apologized to Kevin Trenberth (whom, as it turned out, was in a position to scuttle that editor’s personal research funding) despite not being able to cite a single problem with the paper! This is science? No otter17, it is not. The main problem I see with Mann is his attempt to rewrite history. I have been fascinated with the ‘paleo’ world since 1960. What Mann proposes is a complete fabrication, and overturns all previous decades of paleo-climatology work. But it is not presented that way. It is presented as if there was no previous work, and there is to be no discussion, ‘the science is settled’, by consensus. Complete crap. Sigh, your question didn’t seem to have much of a point, but sure, I’ll bite too. If the supposed disaster was a few days away, I would quickly release the data to the various members of the appropriate scientific community such that it isn’t interpreted incorrectly, and to check my results. Thus, we would quickly confirm the nature of the threat, then warn the appropriate national security officials. Then, full release of data in a ticker tape parade fashion. I’m not sure what this shows. “Peer review is not important”. No, it is part of the scientific process, and it is important. And yes, data and methods are important, too. The original Mann work has been reviewed and confirmed by other scientists with different methods; also reviewed by IPCC, NAS, etc. Those scientists used the scientific process, and there were some modifications on error bars, again science at work. Quite a bit of data is available; some is held by entities outside of the scientists themselves and requires due diligence to go to the original data holder. Some data is even available online, at the link below for example. And you say I am a “lemming of Mann’s alarmist narrative”. Your choice of words does not make you sound tough or correct, only immature. The accusation game is useless in both ways; maybe you are a lemming of a “shoot the messenger” narrative, who knows. The real issue is, we have a set of evidence that has been put through the paces of the scientific process, including data shared with a large number of other scientists. On the other hand, we have non-peer reviewed information. Yes, this new information has a slight chance of being valid, but as a lay person, it is not very skeptical to uncritically accept the work that hasn’t gone through the scientific process, while deriding the work that has. That being the case, how do you excuse your heroic Dr Mann from his behaviour? He insists that a huge disaster awaits us, just a few years down the road unless we take steps that will cast billions into abject poverty and push those already in poverty into starvation. Yet he refuses to release his data and methods. Why is that? You cannot define science as being conducted exclusively in journals and retain any credibility. Journals are not only hopelessly corrupt, they are, like the newspaper, obsolete. You’re trying to assert candles being superior to light bulbs because they have a longer history and better documentation and there were millions of candle makers and only a few manufacturers of light bulbs. The millions of candle makers have spoken, there is a consensus, and the light bulb doesn’t work, the science behind it hasn’t even been published in a peer reviewed journal, so it must be a lie. The science of candles and light is settled. No point installing light bulbs in your house, there is a consensus, a peer reviewed, published in journals, consensus. How many journal articles did Henry Ford publish? How about Alexander Graham Bell? The journals provide framework for the scientific process, yes. The blogs, on the other hand, present information that isn’t reviewed by the scientific community, but is almost exclusively put in the public lay man’s eye. In order to get respect from truly skeptical people, submit information to the scientific community for some real evaluation. Also, you are conflating engineering discoveries with scientific discoveries. Furthermore, you may be victim of a narrative fallacy. You see a handful of recent high-profile incidences with peer review journals, and extrapolate that to a far-fetched notion that “the entire system is broken”. The rational view is that certain papers are rejected due to their errors and inability to counter a larger body of proven papers. The irrational view jumps to the conclusion that widespread corruption has taken hold to spread an agenda. If all these scientific academies and journals are so demonstratively corrupt, then where is the huge Congressional inquiry? Where are the investigative reporters blowing the doors off this? Why hasn’t the media picked up this potentially huge story? Headline news: “Corruption Found in Every Journal and Scientific Academy Related to Climate Change”. From the outside looking in, learning more about the subject of climate change, this incredibly broad accusation of corruption seems far-fetched considering the lack of an equally broad base of investigations and evidence. I’m quite skeptical of this notion. I believe the peer review system was designed with good intentions to reinforce the scientific method and to provide a way to ensure research is credible. That is why I cringe every time I see an argument like what is coming from Seth and Otter17. There is a danger in putting blind faith in a what a says journal simply because it claims to use peer review. frankly, considering the well documented evidence of scientific malpractic and downright fraud coming from a certain “team”, I consider an internet blog (that does not use hall monitors to block dissenting opinions), to be more credible than certain journals which under “occupation” by these criminals. I was unaware that the head of the Italian neutrino project got fired. I’ll take your word for it that the reason he got fired was as you stated. If true, it’s a sad day for science–hell, it’s a sad day for mankind. I guess the new Italian motto is “Political Correctness Uber Alles”–or is that the new German motto? It’s hard to tell in the new homogenized Europe. The science of candles and light is settled. No point installing light bulbs in your house, there is a consensus, a peer reviewed, published in journals, consensus. So, first you assert a notion that journals are obsolete (blogs to replace them I guess?). Then you make a faulty analogy demonstrating your initial assertion, claiming that there is some fictional scientific consensus that candles are better than light bulbs. Finally, you project that faulty analogy onto me, and claim that I am ludicrous. All this seems like a cop out, to believe what you want to believe, while ignoring the scientific process and the existing framework (which is superior to blogs). If peer-review is obsolete, then why have there been successful attempts in the past to submit to peer review publications, such as the BEST collaboration, or Fall, et al, 2011? Why not forget about that entirely and stick to the blogs? Furthermore, why are you so sure that we must “… take steps that will cast billions into abject poverty and push those already in poverty into starvation”? Even Chevron, who has every interest to discredit the established science, quotes the IPCC indicating that it is very likely that a significant level of warming is due to human activity. Then they lay out a measured plan to approach the issue while still helping people. Unless you have some evidence for that statement, it seems you are displaying unfounded alarmism concerning solutions, and it does not help the policy debate. otter17, you have no idea what you’re going on about. None. Instead of wasting everyone’s time here, you should spend the next sevral weeks reading the WUWT archives. Learn something for a change, instead of emitting your free-association ramblings. I think peer review was designed with good intentions and is very effective as long as there is no political pressure to favor one particular side. Unfortunately, with the topic of AGW, peer review went from serving as a gate for seperating good science from bad science, to a gate that just blocks research not in agreement with the gatekeepers. journals, without also considering the politics at play. Considering the well documented evidence of scientific malpractice and downright fraud on the part of a certain “team”, I consider a blog (at least on that doesn’t use hall monitors to block dissenting opinions) to be more credible the certain peer reviewed journals. How do you excuse Michael Mann insisting we take dramatic action while refusing to disclose the methods and data upon which his recommendations are based? Not a diatribe, I was asking some tough questions, that seemingly go unanswered, or the answers provide a very minimal standard of evidence. All these assertions that blogs would be better than journals ignore that blogs are rife with political speech and ideology. There are plenty of blog articles that indicate climate change mitigation is impossible, which is a belief that is potentially in direct conflict with a body of evidence that indicates a need for an appropriate and rational risk mitigation strategy. I provided a link to data that is freely available online, if you look for Mann under reconstructions you will find him. Mann has given data and methods, allowing a lot of other scientists and the NAS to review his work (all corroborating, though with caveats). Other scientists have used different data and methods and have come up with similar results. What specific piece of data is he supposedly hiding, such that I can learn about it? I can’t stress enough my skepticism of the notion that there is a vast failing in nearly every journal, scientific organization, and among a vast majority of practicing climate scientists. I am also equally skeptical that a handful of blogs that also discuss political issues, will somehow have all the right answers. There are anti-evolution blogs that employ similar tactics. Mann et al’s “hokey-stick” papers attempted to eliminate from the historic record the reality of the Medieval Warm Period. Why? Because the MWP was warmer than today, and proves that there is NOTHING unusual happening in today’s climate. There IS NO humanmade global warming crisis. The first of Mann’s hokey-stick papers appeared soon thereafter, in 1998. Sure enough, the Medieval Warm Period AND Little Ice Age were GONE, vanished from the historical record! No doubt the widespread famines of ~1700 during the Maunder Minimum, and the freezing cold of Napoleon’s retreat from Moscow in 1812 during the Dalton Minimum never really happened – these were all fabrications of “climate deniers”, all employed by BIG OIL (sarc off). The ClimateGate1&2 emails confirmed the reprehensible character and odious behaviour of the Global Warming cabal. There is no need to debate these facts. Meanwhile, the very-scary predictions of the IPCC and other global warming alarmists have ALL failed to materialize – the warmists predictive track record is abysmal – it is 100% FALSE. Despite increases in atmospheric CO2, there has been NO net global warming for 10-15 years. Mann-made global warming is the mantra of scoundrels and imbeciles. There are plenty of blog articles that indicate climate change mitigation is impossible, which is a belief that is potentially in direct conflict with a body of evidence that indicates a need for an appropriate and rational risk mitigation strategy. I will leave it as an exercise for the student to deconstruct what is wrong with that sentence. One can start by focusing on “indicates a need” vs “indicate … is impossible”. Your ignorance knows no bounds. Take Smokey’s advice and do some research. Your only argument is that Mann’s work appears in journals, so it is science and criticism of him that doesn’t appear in journals is not science. You can find no excuse to justify Mann’s refusal to release the data and methods upon which his conclusions are based, so you engage in misdirection and obfuscation. You haven’t said a word one way or the other about the science itself, most likely because you are incapable of doing so, and rely instead on the opinions of others. That’s called arguing from authority, and it really doen’t mean much in the face of actual facts. Stop whining. If you cannot discuss the science directly, you are by default incapable of judjing the science for yourself one way or the other, and your reliance on argument by authority is just an excuse for being intellectualy lazy. I gave a link where he has data shared. He has shared his methods and data with a number of other scientists and the NAS. Which particular piece of data is he hiding? It would be nice to know. I understand the science fairly well for a layman, but since I don’t do direct research in climate science I can’t make up my own value judgments based simply on my common sense (as some are prone to do on blogs). This is why we have a scientific process of journals, peer review, rebuttals, etc, to ascertain knowledge (which eventually makes it into science textbooks by the way). Pointing to research that has gone through that process is not argument from authority any more than citing a textbook, since there is no one particular authority referenced, except for the scientific process itself and the multitude of viewpoints and research that went into that process. An argument from authority is thinking that a single piece of research on a blog is correct, while it has yet to start through the established scientific process. An argument from authority is thinking that blogs can now supercede journals, when blogs have no track record whatsoever in ANY field of science. Otter17: “…blogs are rife with political speech and ideology. “. So are journals. The difference is that the journals ideology is hidden from public view. Fortunately, someone leaked several years of emails allowing us to see the malicious behavior going on behind the curtains. Well that has become painfully obvious. And, having admitted that you are incapable of judging the science for yourself, you have no means to determine if what you are reading is credible or not. You’ve accepted the authority of the journal system, and you cite the journal system as backing your position, despite having admitted that you don’t understand any of the science presented in the journals, nor the criticism of it. Since you understand neither by your own admission, STFU. That’s your whole problem right there. If you have is what the “authority” says, you really have nothing. Learn to think for yourself. “…blogs are rife with political speech and ideology. “. That wasn’t from a journal, but emails between scientists. Many in the media/blogs took a good chunk of those emails out of context. Out of about 1000 stolen, only a handful had anything resembling malpractice. Something like six independent investigations looked into the context of the emails and found no major malpractice. I have seen a couple of the investigation reports and a handful of the emails. They were rational analyses of the incident. You’ve accepted the authority of the journal system, and you cite the journal system as backing your position, despite having admitted that you don’t understand any of the science presented in the journals, nor the criticism of it. Since you understand neither by your own admission, STFU. My analysis of sources is where my critical thinking and capabilities lie primarily within climate science. I have the mathematical and scientific analysis capabilities of a grad-school level engineer with some experience, so I have some capability to understand science. Nevertheless, I am not going to think that I can hold an intellectually robust view that is contrary to a piece of science that has been confirmed several times (such as Mann’s work). That would be quite presumptuous of me. Thus, I think it is completely reasonable to be skeptical of a piece of work that has not gone through the same process. This is healthy skepticism. Since you admit you do not understand the science in the journals, nor the criticism of it, how can you possibly judge the quality of the quality of the invesigative reports? And, wow, we’re really impressed that you read a “handful” of the emails. Many people on this blog have read hundreds, and we’ve researched their context. Further Mr Argument from Authority, you would be shocked how many people commenting on this blog have PhD’s and do research directly relevant to climate issues. You admit you know nothing about the issue, yet babble on making an even bigger fool of yourself with each additional comment. Go read a few hundred emails, go read a few papers and when you hit terms and concepts you don’t understand, look them up and read about them until you understand them and then the paper itself. But for goodness sakes, cease being the fool who opens his mouth and leaves no doubt. Spoken like a true sheep. Have you actually read any of the emails? Or is this another case of just repeating the talking points used by an “authority”? “We will keep them out somehow — even if we have to redefine what the peer-review literature is!” , Phil Jones to Michael Mann. This is intellectual baby talk. On the other hand, maybe you are just a blind follower of the consensus of the given day so don’t put your words up as meaning anything. So, I ask generally, what should the layman do to learn about climate science? Read only blogs? Smokey above said I should read the WUWT archives to learn something instead of my knowledge on “free-association” (whatever that means). That seems like a very direct appeal to authority. I would rather gather information from a variety of sources first, then take a look at the hypotheses on blogs. What about the DoD Quadrenniel Defense Review? The military is outside the journal community, too. And the military tolerates zero bullcrap in their assessments of threats. what the military thinks about potential impacts from potential climate change has nothing to do with this entire thread. The discussion is about Dr Mann and what he passes off as science. It appears that otter17 has never been in the military. The military is just like NASA, it takes it’s marching orders from the top. NASA now has Muslim Outreach as a priority, and the military is playing along with the C-in-C’s eco-nonsense. The Roman emperor Heliogabalus [Elagabalus] ordered his legions to collect 10,000 pounds of cobwebs. I doubt there was one Roman commander who did not say, “Sir, Yes Sir!” no matter how nuts they thought he was. But they collected the cobwebs. If otter17 wants the straight skinny, he needs to listen to what retired astronauts think of the climate change scare. They tell it like it is. Itz worse than that. otter17 is trying to claim that the military thinks climate change is real, and so Dr Mann’s papers must be right. The break down in logic from someone who claims to be at an engineering masters degree level of analytical thought is frightening. Either otter17 has no clue what analytical analysis is in the first place, or engineering programs are in deep, deep, trouble. As I work with engineers on highly technical matters on a daily basis, I’m confident that the problem is with otter17, not the engineering profession. I’m compiling a list I’m calling The Sins of Mann for quick reference in the future when discussions come up with nitwit defenders of Dr Mann. Am I missing any of the big ones? Sin1; Dr Mann claims that tree ring thickness responds primarily to temperature alone, and that this is the consensus position of science. Reality; The consensus position of arborists, botanists, and biologists stands in direct opposition to this claim. Further, this claim defies logic. If temperature were the only significant factor in tree growth, the fastest growing trees in the world would be in the Sahara. Sin2; MBH98 is claimed by Dr Mann and his co-author to “prove” that the world is warming at an accelerating rate. Reality; The Wegman Commission demonstrated that a version of Mann’s code they obtained would seek out hockey stick shaped data and attribute higher statistical value to it that any other data, thus producing a hockey stick shape output nearly regardless of the data. Dr Mann claimed that the version of code available to the Wegman Commission was not his “actual” code, but has refused to release the “actual” code or data for verification of his claim. Sin3; Dr Mann’s supporters claim the Wegman report has been discredited. Reality; The only claim made against the Wegman report is that it improperly attributed a single quote that wasn’t even central to the issue. The central findings of the Wegman report have never even been disputed, let alone discredited. Sin4; Dr Mann used sediment data known as the Tiljander Series to augment his tree ring studies. Reality; Dr Mann was advised that the sediments in the lake had been mechanicaly disturbed and over turned prior to sampling, turning the temperature record they supposedly represented “upside down”. Despite being made aware of this, Dr Mann used the Tiljander series anyway, and has not withdrawn the paper or results derived from them. Sin5; Mann was accused of malfeasance on several scores which he claims to have been cleared of by investigation on the part of the universities involved. Reality; Anyone who reads the investigation documents becomes quickly aware that the issues central to the accusations against Dr Mann were never put in direct questions to him. Further, what few difficult questions were asked of him were responded to indirectly or in a manner so confusing that the answer hardly seemed related to the question. Sin6; Dr Mann claims to be an open and honest scientist who has done nothing wrong, and has nothing to hide. Reality; Dr Mann has gone to court, seeking intervener status, in order to prevent his email exchanges with other climate scientists to be made public. His reasoning is that only he can understand them. If that were the case, one can only wonder with whom he was corresponding, and to what end, since only he could understand what he wrote. Sin7; Dr Mann claims that Phil Jones reference to “Mike’s Nature trick” was out of context and only referred to clever but proper handling of the data. Reality; Dr Mann truncated tree ring data from his paper submitted to Nature because it began declining, rather than rising like a hockey stick. He patched in instrumental data instead, without explaining what he had done. This was the “trick” that he used to “hide the decline”. Having now been caught, Dr Mann reluctantly admits that the tree ring data goes in the opposite directionh to the instrumental temperature record for nearly half of the instrumental record. Despite this, Dr Mann continues to claim that the previous 900 years of tree ring data (which cannot be corroborated) accurately represent temperature. Smokey above said I should read the WUWT archives to learn something instead of my knowledge on “free-association” (whatever that means). That seems like a very direct appeal to authority. I would rather gather information from a variety of sources first, then take a look at the hypotheses on blogs. Between the posts and the comments at WUWT, you can get an excellent overview of both sides of pretty much any argument — *with* links to source material. The QDR is produced by DoD and it’s based on input from national security sources — the civilian side — so the threat assessment can (and does) change with the political winds (i.e., bullcrap). There’s more flexibility at the tactical level — for example, helicopter flight regimes. In Iraq, the policymakers based the assessment on the most-catastrophic threat, the SA-7 MANPAD, rather than the most-likely threat, small arms fire. When we started losing a lot of helicopters and crews to small-arms ambushes because we were flying below 200 feet AGL, the policymakers got smart and allowed flight crews the leeway to fly at altitudes based on the most-likely threat in a particular area. No. I was floating the QDR out there to see what you guys thought of it. Before making such judgments about me, it is proper form to clarify first. I have given you that courtesy. I have refrained from such language as “STFU” and calling one a “fool” or “nitwit” as well. An apology is requested. But, back to the subject at hand, it appears that in your view that the blogs are where a lay person should go to learn about the latest science. But which blogs are credible? There are quite a few blogs out there that make potentially better cases for much of climate science, like Tamino or Skeptical Science. How is the average person supposed to begin learning about the subject? I’m just trying to understand the mindset. Sin 1; So, why does a concensus matter now, when it didn’t before? Also, the fastest growing trees would not necessarily be growing in the Sahara area, since the species of trees are completely different. These concerns have been addressed, and trees are useful as a climate proxy since a given species will indeed track tree ring size with temperature. There are some issues with various environmental effects, though, particularly in the modern era. Sin 2; Actually, it was Wegman that refused to release HIS code, as I recall. Wegman altered the original code for his particular analysis. Sin 3; Actually, there were many criticisms of the Wegman Report, not even including the fact that other methodologies have produced similar results to Mann et al. There are other hockey sticks to disprove after Mann’s you know. And on and on. Why should people take your interpretation of the events and validity of the hockey stick when they can actually go to the base documents? You provide no citations, whereas Wikipedia, on the other hand, does. And if your criticisms are correct, why wasn’t Rep. Barton and Rep. Whitfield able to overturn the hockey stick via their commissioned Wegman Report? How did this supposedly shoddy science slip through their fingers? If you think that Tamino and Skeptical Science are blogs with actual science on them, then by all means, go spend your time there. You’ve added zero to the dicussion of science here. It took eight years before the “Divergence Problem” was revealed, also in testimony. Mann grafted modern surface temperature data onto earlier tree ring temperature proxies to produce his upward-sloping “hockey stick” graph. Grafting together two different datasets is usually NOT good scientific practice. Why did Mann do this? Because if he had exclusively used tree-ring data, the blade of the hockey stick, instead of showing very-scary warming in the last decades of the 20th Century, would have shown COOLING. The correct scientific conclusion, in my opinion, is that using tree rings as a proxy for temperatures is not sufficiently accurate for the major conclusions that were drawn from the Mann studies. Mann and the IPCC were clearly wrong about the hockey stick – the only remaining question is not one of error, it is one of fraud. Here’s some interesting reading on wikipedia. I stopped trusting them as a credible source of information (on controversial topics) a long time ago. But this still doesn’t address how a potential newbie to the debate is supposed to choose a blog, or set of blogs to believe. If blogs or even think tanks become the new standard for science, then it becomes a crap-shoot of articles from non-experts, cartoons, politics, Unabomber comparisons, etc, with no organized way to collate knowledge. Furthermore, if blogs became the new standard, all the current scientific establishment (with all their data, laboratories, measuring equipment, etc) would simply move to the blogs and you have the same issue. As it stands now, though, blogs provide an outlet for potentially unfounded hypotheses that aren’t subject to the scrutiny of those with actual measuring equipment, laboratories, etc. It is potentially a breeding ground for a self-promoting set of ideas, maybe leading to all manner of fallacious arguments and conspiracy hypotheses. And no, I have added much to the discussion of science and epistemology. I have added several pertinent questions and ideas on how to logically approach the epistemology of this subject. You state that I have “added zero” as if it were fact, yet I have asked some very important questions concerning how one approaches sources. Other very relevant questions concerning the level of evidence to show all-encompassing corruption in all the journals and scientific organizations go unanswered. Both the Wegman and North Committees condemned the Mann et al methodology. The debate over Dr. Mann’s principal components methodology has been going on for nearly three years. When we got involved, there was no evidence that a single issue was resolved or even nearing resolution. Dr. Mann’s RealClimate.org website said that all of the Mr. McIntyre and Dr. McKitrick claims had been ‘discredited’. UCAR had issued a news release saying that all their claims were ‘unfounded’. Mr. McIntyre replied on the ClimateAudit.org website. The climate science community seemed unable to either refute McIntyre’s claims or accept them. The situation was ripe for a third-party review of the types that we and Dr. North’s NRC panel have done. While the work of Michael Mann and colleagues presents what appears to be compelling evidence of global temperature change, the criticisms of McIntyre and McKitrick, as well as those of other authors mentioned are indeed valid. “Where we have commonality, I believe our report and the [NAS] panel essentially agree. We believe that our discussion together with the discussion from the NRC report should take the ‘centering’ issue off the table. [Mann’s] decentred methodology is simply incorrect mathematics …. I am baffled by the claim that the incorrect method doesn’t matter because the answer is correct anyway. Method Wrong + Answer Correct = Bad Science. The papers of Mann et al. in themselves are written in a confusing manner, making it difficult for the reader to discern the actual methodology and what uncertainty is actually associated with these reconstructions. It is not clear that Dr. Mann and his associates even realized that their methodology was faulty at the time of writing the [Mann] paper. We found MBH98 and MBH99 to be somewhat obscure and incomplete and the criticisms of MM03/05a/05b to be valid and compelling. Overall, our committee believes that Mann’s assessments that the decade of the 1990s was the hottest decade of the millennium and that 1998 was the hottest year of the millennium cannot be supported by his analysis. [The] fact that their paper fit some policy agendas has greatly enhanced their paper’s visibility… The ‘hockey stick’ reconstruction of temperature graphic dramatically illustrated the global warming issue and was adopted by the IPCC and many governments as the poster graphic. The graphics’ prominence together with the fact that it is based on incorrect use of [principal components analysis] puts Dr. Mann and his co-authors in a difficult face-saving position. We have been to Michael Mann’s University of Virginia website and downloaded the materials there. Unfortunately, we did not find adequate material to reproduce the MBH98 materials. We have been able to reproduce the results of McIntyre and McKitrick. Generally speaking, the paleoclimatology community has not recognized the validity of the [McIntyre and McKitrick] papers and has tended dismiss their results as being developed by biased amateurs. The paleoclimatology community seems to be tightly coupled as indicated by our social network analysis, has rallied around the [Mann] position, and has issued an extensive series of alternative assessments most of which appear to support the conclusions of MBH98/99… Our findings from this analysis suggest that authors in the area of paleoclimate studies are closely connected and thus ‘independent studies’ may not be as independent as they might appear on the surface. It is important to note the isolation of the paleoclimate community; even though they rely heavily on statistical methods they do not seem to be interacting with the statistical community. Additionally, we judge that the sharing of research materials, data and results was haphazardly and grudgingly done. In this case we judge that there was too much reliance on peer review, which was not necessarily independent. Based on the literature we have reviewed, there is no overarching consensus on [Mann’s work]. As analyzed in our social network, there is a tightly knit group of individuals who passionately believe in their thesis. However, our perception is that this group has a self-reinforcing feedback mechanism and, moreover, the work has been sufficiently politicized that they can hardly reassess their public positions without losing credibility. Did Wegman and North Disagree? In once recent thread, he claimed that by constructing buildings, we were reducing the surface area that could radiate directly to space. When I pointed out that this could only be true if the roofs of the buildings themselves didn’t radiate, he became strangely silent. I don’t follow all threads by any means, but that is the last I recall of him on this blog, so if it was me that frightened him away, I’ll apologize. Mr Connolley, I’m sorry that you said something so stupid that pointing it out made you look foolish and frightened you away. Hardly. I provided a link so anyone interested could examine the context. What Hantemirov has done is expose the shortcomings of the ‘audit’ approach to science. Yes, McIntyre provided the bare source code he used to make his plot. But this just tells us how the plot was made, not the details of how the data were selected, limitations, data profiles, errors etc. Thus the difference between blog science and the real thing become plain. Nor did he perform the basic courtesy of contacting Hantemirov before posting his ‘analysis’. No wonder Hantemirov is hacked off. Given McIntyre’s record as ‘scourge of climate science’ something of a double standard at work here, no? There is even a serious question whether that comment came from Dr Hantemirov. Well, the brave auditor is taking it seriously. Tell me, if the Yamal data is the source of all hockey sticks, how did Professor Mann manage to plot one without a single Yamalian tree in MBH98/99? Steve has an amnesia. I had sent him these data at February 2, 2004 on his demand. @david, do you remember what thread that was in? Educate yourself in the basics. Find out for your self what “CO2 is logarithmic” means and figure out for yourself what that implies about itz ability to warm the planet. Gets some books on botany and read up on the factors that govern plant growth, and the relative importance of each in comparison to temperature. Pick up a geology text book and read through the history of the ice ages and what their causes were. Read some history books that focus on human activity during the Medieval Warm Period and the Little Ice Age. Check out articles on receding glaciers in the current period which are exposing the remains of human civilization that precedes the glaciers. Take a look at the data from UAH and GISS on a regular basis. If you are really a newbie with a real interest in the issue, these are the things you need to do for yourself to have any hope of understanding the issues. If all you want to do is play “my cite is better than your cite” you will learn nothing, you will teach nothing, and you will waste other people’s times as well as your own. This site must be required reading for Police Fraud Squad Officers. Now it’s time for public prosecutors to go after crooked climate scamsters !!! Thanks for that link. I just briefly read some of the discussion, I’ll read the who thing when I have more time. As one who’s been on the receiving end of the WMC & Co. brand of “wiki-bullying” (many years ago) , it is immensely satisfying to see this condescending jerk get put in his place. ……I can’t stress enough my skepticism of the notion that there is a vast failing in nearly every journal, scientific organization, and among a vast majority of practicing climate scientists…..
Then you are extremely naive. Scientist lie and cheat just like everyone else. Here is your evidence and these are only the ones who got caught and the journals did not cover-up for. While the transgressions in the Sames-Sezen and Breslow sagas are very different, we can use both events as probes for how the ACS (through C&EN and JACS) deals with unethical behavior. A lot has changed in the past six years. Sometimes, the full story of scientific misdeeds isn’t clear until several retraction notices appear. Take the case of a group of Vietnamese astrophysicists led by Thong Duc Le. This article has been withdrawn at the request of the Editor. The Publisher apologizes for any inconvenience this may cause. The full Elsevier Policy on Article Withdrawal can be found athttp://www.elsevier.com/locate/withdrawalpolicy. This paper has been formally withdrawn on ethical grounds because the article contains extensive and repeated instances of plagiarism. EPL treats all identified evidence of plagiarism in the published articles most seriously. Such unethical behaviour will not be tolerated under any circumstance. Retraction: Open and closed conformations reveal induced fit movements in butyrate kinase 2 activation. J. Diao, Y. D. Ma, and M. S. Hasson. The Editors of the Journal of Landslides in agreement with the authors and the publisher hereby retract this article. Bet v 1d structure and the crystallographic section of the J. Immunol. Those are just from a quick ten minute search. Connolley showed up on a couple of threads at Tallbloke’s as well, and got to looking awful foolish awful fast. When he’s in a conversation where he doesn’t have editorial control, he is out of his depth on the science by about the second sentence. I share your frustration with wikipedia, but what has happened to it was inevitable. Being crowd sourced, any controversial topic becomes a target for propogandists. The battles to control the content about middle east history, or the Armenian holocaust, or anything else you can think of where emotions and political advantage are major factors are sickening. For those sort of topics, wikipedia isn’t just untrustworthy, it is dangerous. Where can I find these. I would be interested to read any I could get my grubby little hands on. There have been quite a few finds in the last few years, many of them reported in newspapers as local events, many in archeology papers, but narry a mention of climate when they are brought to light. Yet, there they are, proof positive that humans lives at a time when the earth was much warmer than it is now, and not an SUV in sight. >What Mann and “The Team” have done is dragged the reputation of science and scientists in >the mud. As a chemist I became so disgusted with the bandwagon following the team I quit both >professional societies I was a member of for decades. I wouldn’t confuse dragging a reputation through the mud, and being a celebrated scientist, vilified by a few idiots. Found that he has any case to answer. That he’s not a good a man as Dr. Michael Mann? But that’s okay, I’m not as well recognised either. That’s a lot different from the climate change situation. For one thing there wouldn’t be time for the public to do verification. They’ve been trying to verify the greenhouse effect for 150 years, and haven’t managed yet. Holy cow! I wasn’t aware that Hantemirov was a CRU scientist! Why, that changes everything. Was he a co-author on Briffa 2000 as well? Nope, that Dr Mann is just as much a selfish jerk as Seth. With all this time on his hands to make public his data and methods which he insists foretell disaster, he refuses. There’s plenty of time to review his work and decide if the action (which he says is urgent) is warranted. Can’t do that if he won’t release the data and methods, can we? But then, he doesn’t appear to be following his own advice and saving himself either. Is he buying land in the area of the world that he claims will be the last few left habitable? No. Is he seeking citizenship in the few countries like Canada that he says will survive? No. Is he doing a single thing to protect is children and grandhchildren from the looming disaster he insists he knows is just a few years away? No. What difference does a few days or a few years make? If he “knows” that there is a disaster coming, he owes it to humanity to explain how he knows that, and he owes it to his family to act to protect them. He has done neither. I’ll take the logical conclusion regarding those facts over all the links and cites and accolades that Dr Mann has collected and ever will collect. Who made that statement? You? Nice strawman. Mann did a similar trick. He grossly overweighted one grove of trees to come up with his HS. One grove of stripbark Bristlecone Pines in the US Soutwest took precedence over all the other proxies in his “study”. Briffa used a single tree from Yamal to garner the same effect. Can’t do that if he won’t release the data and methods, can we? Sorry can’t find it. Could you please post a link to the specific data and the specific code used to produce the hockey stick graph in MBH98? Let me save you some time looking for it Seth. Dr Mann testified that he would not release his code for MBH98 because it was very special code and that there was no guarantee that it would produce the same result when run on another computer. If you truely think that Mann and his Hockey Team have been forthcoming and open with all of thier data, I suggest you read a book called “The Hockey Stick Illusion”, by Andrew Montford. It documents about 10 years worth of hiding / refusals to release data, disruption of the scientific method, and in some cases, flat out lying coming from those who are supposed to be scientists. It’s readily available on Kindle and the digital version comes with links to all the original sources used for anything controversial, making it easy for the reader to verify what he/she is reading. Even you are a “true believer” of dangerous AGW, I still suggest you read it as it will help you (and others around you) if you woud just get yourself informed about the issues (of which is is painfully obvious that you are not) before posting your opinions. If you truly think that the best analysis of scientific evidence can be found in books rather than the peer reviewed literature, I suggest you read a book called “Merchants of Doubt,” by Dr Naomi Oreskes. It is subtitled “How a Handful of Scientists Obscured the Truth on Issues from Tobacco Smoke to Global Warming”, and gives a window of understanding of how books like “The Hockey Stick Illusion” can come to be published. Even better, you would do better to read some science before suggesting that some of the world’s most regarded ones are “flat out lying”. Dr Michael Mann’s book “The Hockey Stick and the Climate Wars” might give you some insight into that, and would help you get yourself informed of the issues (of which is is painfully obvious that you are not) before posting your opinions. Did you look under Mann et al (1998/1999)? It didn’t take any time. I’d already given you the link, so all I had to do was click on it, then go to the third page where the paleo reconstructions data and code are.